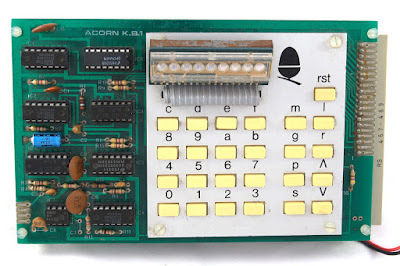 British company Acorn had a history of innovation during the 1980s, with commercial offerings starting with the popular 6502 CPU and eventually ending up with the all-conquering ARM processor which you probably have in your smartphone today. In March 1979, Acorn launched what was essentially the precursor for their consumer microcomputer range – the Acorn System 1. Following a similar pattern to the KIM-1 and Apple I, the System 1 was a board computer rather like a modern Raspberry Pi. Instead of a single-board design, the System 1 was two boards connected together with a ribbon cable. At its heart was the ubiquitous 6502 CPU clocked at 1 MHz with just over 1K of RAM. Input was via a 25 key keypad and the System 1 outputted to a small LED display. Data could be saved to a cassette, and it was possible to add expansion hardware too. Aimed primarily at scientists and engineers, the relatively low price of the System 1 also appealed to tech enthusiasts. The System 1 evolved into the Eurocard-based Systems 2, 3, 4 and 5. Acorn adapted the System 3 into Acorn’s first home system, the Atom. In turn, the Atom was developed into what is probably the definitive Acorn microcomputer, the BBC Micro. And in turn, this led us to the ARM-based Archimedes with the processor that changed the world. You’d be hard-pressed to find an original Acorn System 1 today, but replica boards and components are available if you want to build one yourself, or alternatively an emulator is available.